Kennel Link™ provides a complete, secure, and easy-to-use credit card processing solution that integrates with your Kennel Link™ site. 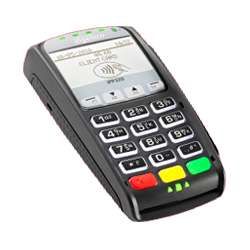 You can process all major credit and debit cards quickly and securely right from your customer's bill. Swipe cards or keep your customers' credit card numbers on-file. You can even capture signatures electronically and avoid having to print signature slips. This reduces processing time while increasing convenience so your workflow is more efficient and effective. Save Time - Process a transaction in seconds. Easily adjust or void payments right from Kennel Link. Store Customer Card Numbers - Securely store your customers' cards on file and charge them with just two clicks. Capture Signatures - Store a digital image of your customer's approval and eliminate the receipt printer. This feature requires either a mobile device or our optional kiosk. Customers Can Make Payments Online - With our Public Access module, your customers can make online payments by logging in to an account they create. Accept deposits for future reservations or payments for previous stays. Security - Cards are encrypted from the moment they're swiped or keyed, leaving no worries about data breach - even while saving credit cards on file. Mobile Payments - Accept credit cards using your smartphone or tablet. Customers may tip and sign. Automation - Approved transactions are automatically recorded in Kennel LinkSM and there is no need to key in the amount on a separate machine. No Need for a Second Phone Line - Processes securely over your internet connection. Reduce Errors - No manual entry using a separate device. Chipped, swiped, tapped, Apple-pay, or keyed? PC or Mac or Mobile Device (smartphone/tablet)? Internet Explorer, Firefox, or Safari? Recommended for gathering signatures and tips if you don't purchase the kiosk. Recommended if you don't use a kiosk and don't want your staff to ask for the tip amount. Recommended with any hardware option if you wish to print a payment receipt instead of the whole bill. Contact Charlie Lautenbach of OpenEdge at (919) 335-0109 to begin the application process. OpenEdge will assist you through the application process and get your hardware working. Kennel Link will assist you with the Kiosk. OpenEdge Technical Support is (800) 774-6462.
or Kennel LinkSM at (877) 789-LINK (5465). Kennel Link is quite easy to figure out. The site is very easy to navigate. I am very pleased with the level of customer service Kennel Link provides. Anytime I have run into a problem, my calls are returned quickly. I wish more businesses could be as accommodating as Kennel Link. I would recommend Kennel Link to others because they are dependable and responsive to requests. I like the fact that we have the ability to customize as we grow and our services change.